I have not posted in several days and I've really missed it. Sir Cuteness LOVES to lay on his tummy on our bed watching Caillou on the iPad. I participated in the CHRISTmas swap over at The Home Spun Heart, again this season. What a fun and thoughtful Swap Buddy. This was our second time to be buddied up, and I LOVED getting to do something fun for her again. She is just so sweet!! This is a jingle bell door hanger and Sir Cuteness LOVES it!!! Handwritten recipe cards of homemade, delicious recipes from her personal collection. and they are now gone!!! She also sent me a homemade pack of Friendship Soup. And here is Sir Cuteness holding the pack of pinecones she sent me from WA. Thank you so much Crystal for your thoughtfulness. My box was just perfect. 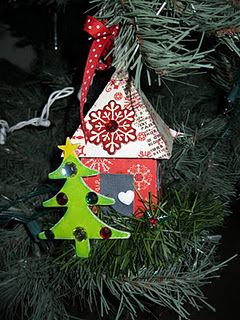 I also participated in the Ornament Exchange over at Faith's blog. and man is she fun!!! I have SO enjoyed getting to know her and her sweet heart. since I didn't take any pictures before I sent them to her. 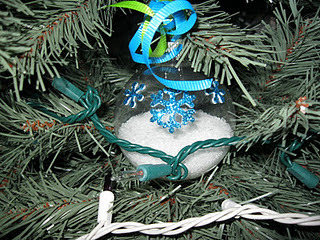 These ornaments were SO much fun to make. Sir Cuteness helped me with this one. Thank you Heather for being such a fun swap partner. It's been a hoot getting to know you!! but it is so much fun!!! Having a 3 year olds excitement in the house is just contagious and beautiful!! There are SO many sweet things I'm documenting with the camera in my heart. I wish I would have found these sites to participate in :( I seem to find out about them too late but LOVE all your goodies! Thanks so much for sharing them. I am doing a Christmas Card exchange if your interested. Let me know! So glad you love your box! Your g-babe is so cute! what fun goodies!!! :) I love the 'snow' ornament. Very clever! OMG HOMEMADE COOKIES AND NEW RECIPES??!!!! Wheewww..let me take a breath...MOMMMMM I'm coming home this weekend and we are cooking, chica! :) love you and your ornament madness! Wonderful goodies! I bet the recipes are the best. I love Carrie and Monica's swaps and have never been disappointed!